Rob Jones - Right-back destined for the top - LFChistory - Stats galore for Liverpool FC! To date, there are only two former players who can say that their father played for Liverpool; Tom Ince and Dean Saunders and one former player who can say his dad actually managed the Reds; Chris Fagan. However, there is only one player who can pride himself of his grandad pulling on the Red jersey; Rob Jones. Rob's grandfather, Bill Jones, made 277 appearances for the Reds and starred in the title-winning side of 1946-47, alongside all-time greats such as Bob Paisley and Billy Liddell. All in all grandad and grandson played 520 games for Liverpool Football Club. Rob talks exclusively to us about the highs and lows of his playing career; from his days at Crewe Alexandra to winning the FA Cup in his first season at his boyhood club to painfully having to cut short his career due to a string of unfortunate injuries. Rob very kindly invited LFChistory.net to join him at the Liverpool Academy in Kirby where he acts as a mentor to the defenders of all ages. He has done that for the last three years and ties it in with a successful chain of nursery schools he runs with his wife Sue in England and Dubai. Rob works alongside academy graduates and former teammates; Steve McManaman who works with the midfielders and Robbie Fowler who concentrates on the forwards. The role of a mentor is primarily based on giving advice and instilling determination and dedication into the youngsters. For instance, Rob will simply sit down for lunch with the players before games and give them inspirational guidance and tips on the forthcoming encounter. I'd like to thank Rob Jones for opening up to us and receiving us with such kindness. Your grandad must have had a story to tell; any stand out? My grandad Bill didn't speak much about his past and was a natural quiet, reserved person. Nevertheless, I loved being in his company as his presence was magical. My grandad was always a man of few words, very modest and very humble. For instance I would ask him what it was like to play with Billy Liddell and he would just say "A great man, a wonderful player and a bit of a joker in the dressing room," and that would be it. You were a young boy when your grandad was a scout for Liverpool. Grandad used to take me to the matches where he used to do his scouting. He first spotted Sir Roger Hunt playing for Stockton Heath, so he wasn't bad at that role either, was he? I still see Roger every now and again and he always speaks fondly of my grandad which is so pleasing. Grandad was also involved in the signings of Ian Rush and John Toshack and told me I attended some of their games, but I was far too young to remember. Bill played in the 1950 FA Cup Final at Wembley, did he ever mention that? I remember my grandad telling me that it was a surprise that his name was on the teamsheet and Bob Paisley's wasn't. He said Bob was very low and even contemplated leaving the club, thankfully he didn't! When my grandad used to take me to the matches Bob Paisley was the manager. I remember my grandad always used to be singing his praises and was extremely pleased for Bob being as successful as he was. They were great friends back in the day. "We are very proud of his achievements and I have to admit he is a better player than I was. He is a lot faster for a start." Bill talking proudly of his grandson. What was your first game at Anfield as a child? My grandad took me to my first game on Boxing Day during the 1979/80 championship winning season (also we went unbeaten at Anfield all season). I was eight and from that moment I was hooked. We were stood on the Kop; it was against Manchester United and the Reds won 2-0, with goals from David Johnson and Alan Hansen. From that day I wanted two things from my life; firstly, to follow my grandad's footsteps and secondly, to become the next Kenny Dalglish. I used to reconstruct every Kenny goal in my backyard when I used to play with my sister. My bedroom was plastered with Kenny posters and photos. Thanks to my grandad I even had one of them signed by the King himself. You went on to learn your trade at Crewe Alexandra from 1987-1991. In 1990 Crewe were paired with Liverpool in the second round of the League Cup. I couldn't believe it when the draw took place, it was a dream come true for me knowing I was going to play at Anfield against the players I still worshipped. Due to my football commitments at Crewe I attended Anfield less frequently as a fan but whenever fixtures permitted I was always in the Kop cheering on the Reds. The first leg was at Anfield and we gave Liverpool an early shock when Andy Sussex scored after eight minutes. However, that was just a wake-up call for the Reds as they went on to beat us 5-1. It was a great experience for me. Ronnie Whelan was captain, Rush, Barnes, McMahon and Grobbelaar were playing and my idol Kenny Dalglish was the manager. I was 18 at the time and as I walked off the pitch I vowed to myself that this wouldn't be the last time I would be playing at Anfield. In the second leg at Gresty Road Liverpool won 4-1, Ian Rush scored a hat-trick to make the tie 9-2 on aggregate. Despite the heavy scorelines, I thought I made a decent account of myself. Could you take us through your transfer to Liverpool Football Club? The lads at Crewe had found out in the build-up to a midweek League Cup game at home to Newcastle that Graeme Souness and scout Tom Saunders would be in the stands watching our right-back. I started the game playing at left-back but at half-time I was switched to right-back. I was happy with my performance and knowing that Graeme was present didn't faze me at all as I never thought he would ever look at me. The following league game arrived against Gillingham and news filtered through that chief scout, Ron Yeats, was in attendance on behalf of Graeme Souness. Again, I personally didn't think anything of it. I later found out that Liverpool had suffered a defensive injury crisis and were in urgent need of reinforcements. The following night, Crewe's manager at the time, Dario Gradi phoned me at home and informed me that Liverpool, my boyhood club, wanted me to head up there tomorrow and sign for them. I couldn’t believe it and struggled to respond. The club I had supported all my life, England's most successful club, the team my grandad played for was interested in me. Dario told me that a friend of Graeme's, Kenny Swain, would pick me up on the Friday morning and drive me to Anfield. After I put the phone down I was overcome with emotion and burst into tears. Liverpool, my team, wanted to sign me. We arrived at Anfield and met with Graeme and Tom. We chatted about football for a while and then Graeme asked me how much I earned at Crewe. I told him I was on £250 per week. He said that Liverpool would double that. I just said yes straight away. I didn't have an agent with me and money wasn't an issue for me. I would have played for free. I just wanted to be able to call myself a Liverpool player. Souness then told me to get ready for training and we will sign the paperwork after training. We were still in the times when the players got changed at Anfield and travelled by bus to Melwood. The lads had already left so Graeme drove me over. When we arrived Ronnie Moran was putting the lads through their paces. Graeme gathered everyone around and introduced me; they were all very friendly towards me, which was a huge relief. I then took part in one of their famous five-a-side matches. I will never forget my first touch, about 30 seconds into the game I received the ball and out of nowhere Steve McMahon came flying in and lunged at me with a type of two-footed challenge that would earn any player an instant red card these days. Did Graeme say anything to you after your first session? All the lads got back on the coach to Anfield whilst Graeme told me to travel back in the car with him. It was during that short drive from West Derby to Anfield that Graeme informed me that I will be making my debut on Sunday, against Manchester United at Old Trafford and marking Ryan Giggs. This was the moment I was waiting for although on the inside I was extremely nervous and startled, on the outside I tried to maintain my composure and told Graeme that I would be ready for the game. I bet you were on cloud nine at this time. Absolutely, I was meant to be playing for Crewe on the Saturday, instead I found myself boarding a bus to Manchester to play at one of the world's iconic stadiums. I remember getting a few funny looks when boarding the bus as I had brought my own towel and training kit with me, something that was the norm at Crewe but obviously not at Liverpool. I remember we stayed overnight at the Cottons Hotel and Spa in Knutsford and my roommate was Mark Walters, a quiet lad, so that suited me. What are your memories of the match and being up against Ryan Giggs? The day of the match is a bit of a blur. I remember winning a header earlier on against Giggs, so that settled my nerves. I kept Ryan at bay during the first half, I remember he tried to take me on a few times but fortunately I was able to keep up with his pace. At half-time, Graeme Souness and Roy Evans just told me to carry on playing the way I was playing during the first half. On the hour mark Gary Ablett got sent off and Graeme wanted to bring on some fresh legs, therefore I was replaced, which was the right decision as I felt myself becoming tired and felt my muscles tightening up. The game finished 0-0 and Mark Hughes also got sent off. The coaching staff seemed happy by my performance, which filled me with confidence. Let’s not forget the previous week I was playing in the fourth division. Due to the international break you had to wait 20 days until your Anfield debut as a Liverpool player against Coventry City. True, as I was also cup-tied for the League Cup and wasn’t registered in time for the UEFA Cup. In-between this time I actually played for Phil Thompson's reserve side at Anfield. This wasn't really ideal as we were trying out new systems; however, I had pulled on the red shirt and had achieved a part of my dreams. What stands out from the Coventry game was my first touch. We had just kicked off and the ball had found its way back to Bruce Grobbelaar. He rolled it out to me and I moved forward towards the halfway line. I tried to lay a pass infield but it was intercepted. All of a sudden, due to my error David Smith was clear through on goal. Thankfully, to my relief I managed to sprint back and slid in to advert the danger. Later, Ronnie Moran gave Brucie a right earful for putting me under pressure. He thought it was unfair to give me the ball in that position to someone who was making their home debut. However, I thought he was just helping to settle my nerves by giving me an early touch. In the end, I thought I put in a solid performance and we ended up winning 1-0 thanks to a Ray Houghton goal just after the hour mark. I suppose the back end of 1991 must have been one of the best periods of your life and 1992 didn't start badly for you either with an away trip to none other than Crewe Alexandra to look forward to in the third round of the FA Cup. Yes, you couldn't have scripted it, could you? Less than three months after swapping Crewe for Liverpool I was heading back there. I saw it as a great opportunity to say goodbye to the fans. I had literally gone overnight, so it was great to see them again. Crewe Alexandra are a small but extremely friendly club. They love to see their past players move up in the football ladder. It's a source of pride that they are able to nurture starlets who go on to have a big impact at the top level of the English game. When I arrived at Gresty Road the staff, players and fans were just really pleased for me. They all wanted to shake my hand, share a joke and the banter was as good as ever. Nevertheless, when you cross that white line sentiment goes out of the window and we eased to a 4-0 win and I had a hand in two of the goals. All in all you made 39 starts in your first season as a Red, not forgetting the small matter of winning the FA Cup. It must have been remarkable for you coming all the way from the fourth division to achieving instant success at Liverpool Football Club? Yes, it certainly was. Regarding the cup final I was worried I was going to miss it due to a shin injury I sustained during the 2-0 win against Man United in the last home game of the season. Subsequently, I was rested right up until the last minute and was delighted when I was named in the starting XI. Sunderland were obviously the underdogs as they were struggling in the old 2nd division, but we weren't going to take anything for granted. We had an extremely tough semi-final against Portsmouth who we narrowly beat on penalties in the replay and we were expecting them to follow Pompey's example. Surprisingly I wasn't nervous at all; just excited about representing Liverpool in a cup final just like my grandad did 42 years earlier. My grandad was in the stands that day and later told me he was an extremely proud man. Ronnie Moran led us out in Graeme's absence, my dreams were about to come true. Sunderland had the better of the first half and we wouldn't have complained if we went in at the interval behind. However, in the second half we stepped it up a gear and Michael Thomas brilliantly put us 1-0 up with a fantastically taken half volley. From my point of view his goal goes down as one of the greatest FA Cup final goals of all time. Rushie then made it 2-0 and we knew the cup was ours. When the final whistle went it suddenly dawned on me that I had gone from starting the season playing for Crewe Alexandra in the fourth division to ending the session with a FA Cup runner-up medal in my hand. That's right, a mistake was made during the presentation and Sunderland were handed the winners' medals instead of the runner-up ones! 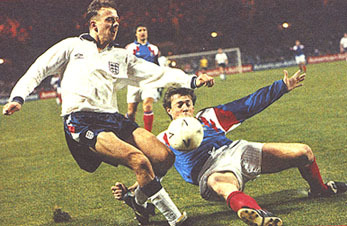 What was it like for you missing out on representing England in Euro 92? The problem with my shins persisted which eventually ruled me out of the tournament. Absolutely, it was a blow for me; however, at the time I tried not to let it get me down too much due to everything I had achieved that season at Liverpool. I was still young and obviously thought there would be more tournaments to come. However, that wasn't to be the case and I only won 8 caps for England in my career. Nevertheless, I'm proud to say I represented my country at the highest level but I must admit part of me does feel that I could have done a lot more on the international stage. It's easy for me to say now, that if it hadn't been for my injuries I would have had a long successful international career and would have gone on to play more than 50 times for England. Maybe, I would have, who knows? It’s easy to play the 'if' game. You became a regular fixture in the team during the next four seasons, playing: 37, 45, 46 and 47 games. However, despite your incredible abilities you never got on the scoresheet, how close did you get? Ha ha, I hit the woodwork a few times and went close but it’s something that didn't really bother me, at the end of the day I was a defender not a striker. I used to get some good banter from the Liverpool fans, every time I shot for goal. I remember during my first season as a red watching the highlights back after the last home game of the season against Man Utd in 1992. We won the game 2-0 which resulted in Leeds winning the league and not them. While I was watching the game back at home Brian Moore was commentating and he summed things up perfectly; "Rob Jones, ohhhhhhh... he's never scored for Liverpool and with shooting like that he never will." Your second honour with Liverpool came in 1995 in the form of the League Cup. Yes, against Bolton, and it was an occasion that proved Macca had arrived as a world class performer. We all knew how good he was but on that day at Wembley he was at his best and ran the show. I know the League Cup is seen as a trophy that isn’t as important as others but it was important for us at that time. We were a young squad and were in our full season under Roy; also it had been three years since the FA Cup triumph against Sunderland which was regarded as a real drought for Liverpool Football Club. I was particularly pleased for Rushie as after everything he had done for the club, lifting a major honour as captain was a special moment and achievement for him and one of the high points during his time at Liverpool. However, in 1996 you missed out on a second FA Cup medal. The club had recently mourned the loss of the great Bob Paisley and many supporters felt it would be fitting to dedicate an FA Cup triumph in his memory, sadly that wasn’t the case. United had just clinched the title so all the spotlight was upon us to deliver. The game itself turned out to be awful and we failed to recreate the type of performance that had seen us outplay United home and away earlier in the season. One goal was always going to win it and unfortunately for us they got it through Cantona’s volley. I was actually on the goal line and didn’t react in time. When I watch the slow motion replay back now, I always expect myself to chest the ball to safety or to get my leg to it. The only real option I had to keep the ball from hitting the back of the net was to handle it, which would have resulted in them being awarded a penalty and myself an early shower and then rely on David James saving the spot kick. It’s easy to analyse it now. It all happened in a split second and sadly I was unable to prevent them from scoring and ultimately from winning the cup. After the cup final defeat your injuries really started to take their effect on you. I'd been playing in agony for as long as I could remember. It must have been as long as 12 months since I had been playing completely pain free. After the defeat to United in the cup final I remember turning to the club doctor and said: 'look, we are going to have to sort this out'. I insisted that I saw another specialist and by coincidence I was sent to one of the practices I attended when I was back in Crewe. The specialist showed me an X-ray of my back that showed my right vertebrae was cracked. I was devastated. He told me I would need at least three or months of complete rest which painfully ruled me out of Euro 96. The doctors at Melwood then reiterated his instructions. I wouldn't be able to do anything. I just needed to rest. No weights, no light jogging, just complete rest for four months. Jones only made four appearances in the 1996/97 season as Liverpool made a decent title challenge. I did make a brief comeback during the 97/98 season, however, I was back to visiting specialists in no time, not with my back though, but now with my knee. I was told I by a specialist that I had 'jumpers' knee, an injury that athletes get from landing on hard surfaces. Firstly, I had my knee scraped and cleaned which proved unsuccessful and I was even told by another specialist who later performed keyhole surgery on me that scraping the knee actually does more harm than good as they rip the top off the tendons and they never grow back. As a final resort, I even had a part of my knee cap removed as it was catching my tendons. However, that didn’t help either and my knee failed to heal. I was doomed and sadly like Owen Hargreaves and Ronaldo it would eventually be the cause of finishing my career. Around this time Gérard Houllier joined Liverpool. Did he say anything to you when he came in? My relationship with Houllier was non-existent. I remember him coming into the treatment room once and told me all my injuries were in my head and if I forget about them, then I would be all right. I was quite upset by the matter and told him he was far from the truth and I would like nothing more than to join the other lads out on the training field. In an interview he did with the press a few days later he said all my injuries were in my mind and I was 'acting' injured. I was furious and had showdown talks with him straight away. Prior to my knee injury Liverpool were willing to offer me a new three-year contact but when Houllier found out the true extent of my problem he soon withdrew the offer. I think if Roy was still in sole charge there would have been a possibility that they would have kept me on, I'm not saying they would have given me the same deal, but I'm sure Roy would have told me to sort my knee out and then the club will look at the situation, instead of, what felt like a 'see you later' from Houllier. Roy had a bit more class than Gérard but was ultimately let down by the club after 40 years of service. Who was the best player you played with during your time at Liverpool? A difficult one, as when I started greats such as Steve Nicol, Ian Rush, Ray Houghton, John Barnes, Ronnie Whelan and Bruce Grobbelaar were still at the club. All of them are legendary players and some were even my heroes when I used to watch from the Kop. However, from my generation the best player I played with was my friend and colleague here at the academy Steve McManaman. When Steve played in the free role just behind the two strikers he was unplayable. Teams used to realise that in order to stop Liverpool they had to stop Macca. A unique talent whose attributes are yet to be repeated in another player, not only at Liverpool, but in football as a whole. Yes, you’re right; people often assume that my playing career was a relatively short one, as it ended when I was just 28. On the one hand, this is true, as many other players carry on playing well into their 30s. However, I started playing professional football for Crewe Alexandra at the age of 16, which is also a lot earlier than many other players start out. Therefore, there is little difference between me and let’s say a player who starts playing at the age of 20 and finishes at 32.